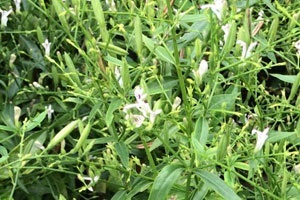 In the west, the plant is known informally as the “king of bitters”, while formally the plant is known as Andrographis paniculata. In a new study published in the Nature Publishing Group journal Scientific Reports, the team of Duncan R. Smith together with the team of Justin Chu at the Yong Loo Lin School of Medicine, National University of Singapore investigated the activity of the main active ingredient of fah talai jone, the labdane diterpenoid andrographolide, against chikungunya virus. The mosquito transmitted chikungunya virus recently caused a large outbreak of chikungunya fever in the south of Thailand, and is currently causing a huge outbreak in the Americas. The results of the study showed that andrographolide had significant anti-chikungunya virus activity in vitro, laying the way for its further development as an anti-chikungunya virus therapy.